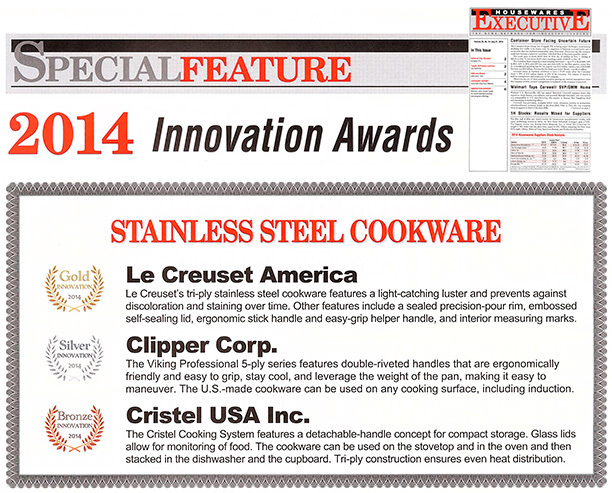 Clipper Corporation, the leading manufacturer and distributer of the Viking Culinary® collection, has been awarded Silver in Housewares Executive 2014 Innovation Awards, highlighting the new Professional 5-ply series in the “Stainless Steel Cookware” category. The Viking Culinary® Professional 5-ply series has gained tremendous recognition for its exclusive multi-ply construction. Featuring five layers of stainless steel and aluminum alloys, this unique design ensures maximum heat transfer and reduces energy usage to deliver superior cooking performance. Each layer of metal is carefully selected for optimum performance and efficiency. The ergonomically friendly, double-riveted handles allow for better balance, making it easy to hold and maneuver while the stay-cool vent design provides maximum comfort and secure handling. Viking Culinary® Professional 5-ply series provides an elegant satin finish with a contemporary look. Specially handcrafted in the United States and with high-quality 18/10 high-grade stainless steel, this cookware also is complete with an aluminum core that transfers heat evenly through both the bottom and sides of the pan, maximizing the utility of all of the cooking surfaces. Each cookware item is suitable for most cooking surfaces including gas, electric, halogen, ceramic and induction. For more details on Viking Culinary, please visit www.vikingrange.com and to learn more about the Housewares Executive 2014 Innovation Awards, please visit www.executivemdiacorp.com.